Will Eating a Bunch of Bananas Make Me Gain Weight? Bananas contain nothing that will make you gain weight, but eating any food in excess can trigger weight gain if you consume more than your daily calorie needs. If you enjoy bananas, eat them as part of a weight-gain strategy to help you add mass. Conversely, you can eat bananas as part of a restricted-calorie diet for weight loss. The results you get -- weight gain or loss -- depend on how many calories you eat, not on whether you eat bananas. Controlling your calorie intake is essential for weight control. The rationale is simple: If you eat more calories than you need, your body will use the excess energy to gain mass; if you eat less than you need, you'll burn fat to make up the difference. Your exact daily calorie target will vary, depending on your activity level, body size, age, gender and fitness goals. Generally, though, you'll want to eat 500 to 1,000 fewer calories for weight loss, which will result in 1 to 2 pounds lost weekly, or 250 to 500 extra calories if you want to gain 1/2 to 1 pound weekly. 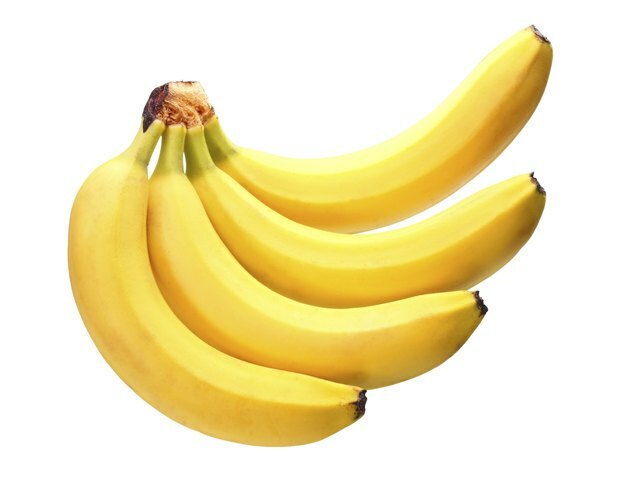 Each small banana has 90 calories, while a large one has 121 calories. If you're trying to lose weight, limiting yourself to one to two bananas per day might be the best approach because it leaves room in your diet for other nutritious foods. For example, one large banana takes up about 10 percent of the calories in an aggressive 1,200-calorie weight loss diet, which leaves plenty of calories in your "budget" to follow a well-rounded diet. On the other hand, if you're trying to gain weight, you could eat a few bananas each day to reach your calorie surplus. Eating two large bananas every day in addition to your regular meal plan works out to 242 extra calories -- enough to gain almost half a pound each week. Eat three large bananas daily, and you'll get 363 extra calories, or enough to gain about 3/4 pound if you ate three every day for a week. If you're concerned that eating bananas will sabotage your weight-loss goals, don't worry. Bananas actually provide beneficial fiber, which might help with weight loss. Fiber helps your food digest more slowly, and, even though it doesn't contain calories, it fills you up so you feel satisfied after eating. Bananas also contain a specialized type of fiber called oligosaccharides, which are prebiotics, according to a review published in Nutrients in 2013. You don't break prebiotics down into energy; instead, they serve as food for the naturally occurring bacteria in your digestive tract. Eating prebiotics can promote healthy gut flora, which benefits your health. Those friendly microbes might also help with weight control; they influence how your body digests the food you eat, as well as how many calories you absorb from your food, the review explains. Obesity can cause imbalances or disrupt your gut flora; whereas, eating foods like prebiotics might restore this balance. Whether you're trying to gain weight or shed pounds, you'll get the best results if you choose nutrient-dense foods as part of your diet. When losing weight, nutrient-dense foods keep you feeling satisfied and ensure you're meeting your nutritional needs; when you gain weight, healthy diet and exercise habits can help you gain muscle, not just fat. Bananas offer lots of nutritional value for your weight gain or weight loss diet. A large banana supplies 20 percent of the daily value for vitamin C, a nutrient that supports your cellular metabolism through promoting enzyme function, which also helps you make collagen, a protein you need for strong, healthy skin, bones and connective tissue. You'll also get 14 percent of the daily value for potassium -- a mineral that promotes heart health and helps your nerves and muscles function -- plus 18 percent of your daily manganese, which supports healthy cartilage. You diet goals will dictate the best way to serve bananas. For example, you might eat a small banana on its own as a snack in a weight-loss diet, or make a relatively low-calorie banana smoothie by blending half a small frozen banana with a cup of nonfat milk and a container of nonfat yogurt for a beverage that contains just 203 calories. On the other hand, if you want to gain weight, you could snack on a few bananas, or make a higher-energy smoothie from two large bananas, 1 1/2 cups of nonfat milk and a 6-ounce container of Greek yogurt for a 445-calorie beverage. While a weight-loss dieter might add a 90-calorie small sliced banana to morning oatmeal, a weight gain dieter might add a cup of banana puree, which contains 200 calories. For individualized help figuring out your target calorie intake -- and the best way to fit bananas into your diet -- consult a nutrition professional. What Happens If You Eat Too Many Bananas? Can You Eat Bananas If You Want to Lose Weight?